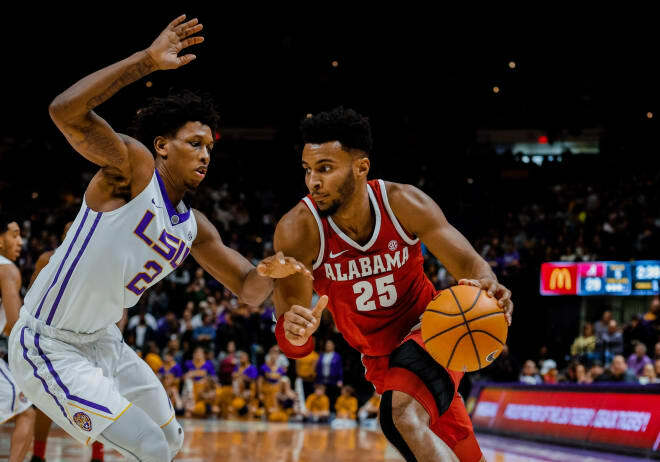 The Alabama men's basketball team picked up its first road win of the season this past Saturday at LSU to move to 3-2 in conference play. But they may find themselves facing a greater challenge when they return to Coleman Coliseum on Wednesday night to play the Auburn Tigers in the first of two matchups this season. Auburn is ranked 17th in the current AP poll, 4-0 in league play, and as hard as it is to write this, look like the best team in the league at the moment. Game time is 6 P.M. CT. Once again our fine friends at the SEC Network will be televising the game. Click the links for team and KenPom stats if you're into that sort of thing. My Two Cents: Anyone who has read my posts at this blog since Bruce Pearl was hired at Auburn know that I don't think very highly of his persona or the negative stories that have followed him like a bad smell at every stop he's been at in college basketball. But I also believe in giving credit where it is due. And the fact of the matter is that Bruce Pearl has done a hell of a job coaching this team, despite all of the outside noise regarding the FBI investigation, the arrest and subsequent dismissal of Chuck Person as a result of that investigation, and the eligibility status of arguably the two best players on the roster, Austin Wiley and Danjel Purifoy. Auburn's non-conference schedule wasn't particularly impressive (not one KenPom top 50 team in the bunch) so it was easy to think that Auburn's hot start was due to a mediocre schedule. But this team has ripped their way to a 4-0 start in league play with the best offensive efficiency rating in the league, and a much-improved effort on the defensive end (currently ranked 6th in d-efficiency in the league at KenPom). There's also more toughness and leadership on this Auburn team than we've seen in many years. Consider for instance that this Auburn team is 4-1 in games in which they've trailed by double digits. You don't do that without mental toughness and an improved defensive effort. This team is not a pretender. Despite the ranking and the good vibes that radiate from a team and fanbase that have won fourteen straight games, we all know that Auburn lives for beating Alabama in any sport. Bruce Pearl knows how much this game means to his fanbase. He's known it from day one, while I think Avery figured it out the hard way last season after being swept by the Tigers. And while I think Pearl struggled to motivate his first three teams on the Plains, this group appears to have better chemistry and leadership that has made it easier for Pearl to get the most out of this team. They'll be ready to play. Donta Hall will miss this game as he recovers from wrist surgery. The initial word was that he would miss up to ten days. That means he could return for Alabama's trip to Ole Miss on the 23rd of this month, but I've also heard he may not be back until the Oklahoma game on the 27th. Alabama overcame his absence last Saturday, but I think his absence is coming at a crucial point on the schedule, and it will be vital that this Alabama team survive this stretch of games until he returns. I thought Donta would be important in this game, and his absence makes me very wary about Alabama's chances. Alas, the game must go on. Players to Watch: How about the whole Alabama team? Galin Smith and Alex Reese were huge for Alabama in Baton Rouge. With Daniel Giddens only playing 8 minutes due to foul trouble, Galin and Alex stepped up and scored a combined 17 points and 7 rebounds, while only committing two turnovers, and only had three fouls total. They, and Daniel, will need to be a presence once again on Wednesday. Actually, the team as a whole will have to be present on the glass, because I think the team that wins the rebounding stat on Wednesday night likely wins the game. Despite no player over 6'8, Auburn was the top team in the league in offensive rebounding efficiency entering their game at Mississippi State. But State's size caused some problems for Auburn in the 1st half, playing good first-shot defense, and limiting the Tigers on the offensive glass. Auburn flipped the script in the second half, torching the Bulldogs from the floor and getting to the free throw line for 24 attempts. But State's size nevertheless was a factor in that game. Donta Hall's presence on the floor as a rim protector would have presented challenges for Auburn. Without him, Daniel and Galin will have to hold their own in the post, while guys like Dazon, Braxton, Alex and Herbert will have to assist on the glass. This Auburn team is deadly enough on offense without the luxury of second and third chance points. If Alabama can't control the Auburn possession count, I don't think Alabama has a chance to win this game. Desean Murray, a transfer from Presbyterian College, gets my vote as Auburn's MVP up to this point in the season. Having watched several Auburn games, I'm always struck by how hard this guy plays, how vocal he is, and how his teammates appear to listen to him when he speaks. In some ways, he reminds me of the role Chris Hines played in his two years at Alabama: a tough, physical guy on the floor that can elevate his teammates with his leadership. The difference in Chris and Murray (11.4 ppg, 7.5 rpg, 1.5 apg, 1.0 spg) though is that Murray is also capable of dropping 20 on you any night. Take him off this Auburn roster, and this is a very different Auburn team we're talking about.